Pianist Joe Baque at a Celebration of Life for Jack Perciful in Olympia. 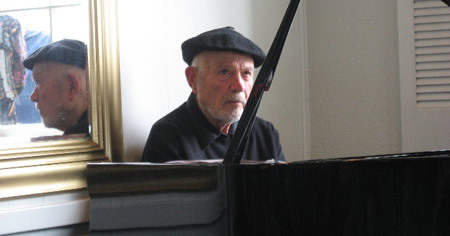 Selections from a tribute to the late Olympia pianist Jack Perciful played by BeBop Revisited, Joe Baque, Pete Christlieb & Bill Ramsay will be featured on this week’s Jazz Northwest, Sunday June 1 at 1 PM on 88.5 KPLU. Also, songs by Roberta Gambarini and Hank Jones not heard on the earlier broadcast of their performance at Jazz Alley will air on this week’s show. Listen to the audio clip below. Eileen is undergoing treatment for cancer and they need an infusion of cash and goodwill. Some of Seattle’s best musicians will perform in two concerts. and more guest artists may emerge in the next couple of weeks. A memorial gathering will be held at the Seattle Betsuin Buddhist Temple, 1427 South Main Street (between 14th and 16th Ave). Please share your personal memories of the illustrious, 60-year career of Seattle promoter, radio personality, journalist and all-around jazz advocate Norm Bobrow, who died April 13. Music and refreshments will be on hand. 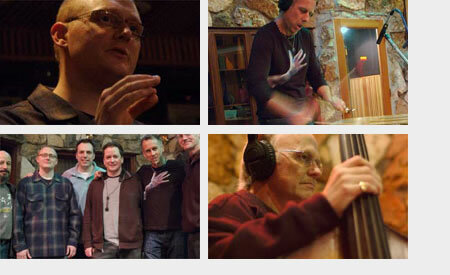 Photos from Thomas Marriott’s recording session last March which featured Joe Locke on vibes has been posted at the Origin Records website. Pop on over and take a look. Things looked dicey Saturday evening for the Bellevue Downtown Association’s ambitious revival of the Bellevue Jazz Festival. But at the eleventh hour, a wildly enthusiastic salsa dance crowd suddenly materialized for the Spanish Harlem Orchestra, the second-night main-stage show, in the downstairs hall of the Meydenbauer Center. The festival took place Friday and Saturday. Couples dressed to the nines packed a temporary dance floor at the center of the room, stepping stately through cha-chas, mambos and danzones, or slow-dancing to a romantic bolero. A shout out from pianist and music director Oscar Hernández revealed a crowd from all over the Latin America and beyond — Colombia, Venezuela, Panama and Brooklyn. Today kicks off the big weekend for the Bellevue Jazz Festival. Dominating tenor saxophonist Branford Marsalis and the infectious Spanish Harlem Orchestra — both Grammy winners — headline the much-anticipated revival of the Bellevue Jazz Festival this weekend. Seattle Jazz Scene published a preview of the festival earlier this week, click here to read the story. View a complete schedule. NEW YORK CITY — Roosevelt High School placed first and Garfield got second place at this weekend’s Essentially Ellington high-school competition, widely regarded as the Cadillac of jazz competitions. Shorewood (from Shoreline) won an honorable mention. Some had wondered if the Puget Sound area would sweep the contest this year; out of 15 finalists chosen nationally, five were local. No region has ever sent five bands to Ellington before. Roosevelt won the competition for an unprecedented third time; by winning the competition twice in a row, it matched Garfield’s first-place repeat in 2003-04. The rivalry between the two schools has played out on this national stage for the past decade — Roosevelt and Garfield also finished 1-2 in 2002 — and this year’s judges said the contest was extremely close. Philadelphia photographer Tom Priemon has published a new book of photographs entitled, “Inner Circle,” documenting a performance by Matt Jorgensen +451 at the Grand Illusion Theater in 2003. 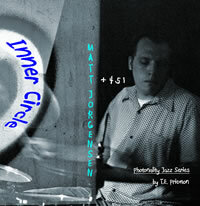 “Inner Circle” with Matt Jorgensen + 451 is a visual music composition using the medium of Photonality. In Photonality the camera acts as an additional instument within the performance, moving in, out and around an axis. Priemon has published a number of photography books featuring jazz musicians including “White Noise” featuring trumpter Cuong Vu. Pianist Victor Noriega is headed back to Shanghai for a series of gigs and to record a new CD entitled, “Shanghai Riot.” Noriega has started a blog to document his journeys which you can read by clicking here. Also, Noriega will release a new CD for Pony Boy Records in mid-August entitled, “Fenceless.” This record features his long-standing trio with Eric Eagle (drums) and Willie Blair (bass) plus guest artists Jay Thomas (trumpet) and Mark Taylor (alto sax).